Participating in the various forums on the technical aspects of fountain pens and specifically nibs, I found, there is a lack of knowledge of the characteristics of metals, steel and gold in particular. The words used are elasticity, flexibility, smoothness, comfort and more. When we want to change the characteristics of a nib, then, as ingeneer, I want to know, what the fundamental criteria are and where to apply my tools most efficiently. I also like to have a sense of what to expect. It is a fundamental piece of ingeneering information and learning to read it, gives a good sense of a material’s behaviour and properties. It helps to explain the essential characteristics of many metals. The curve shows the typical shape of a ductile material. It can sustain significant plastic deformation prior to fracture. Brittle material, besides of often being harder and needing higher loads for deformation, hardly enter the yield area, thus show hardly any plastic deformation before fracture. The curve rises in a straight line. 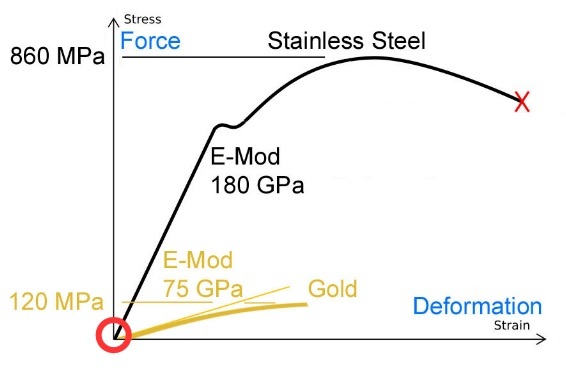 Deformation increases proportionally with the force applied to the component or material sample. This ratio is called the modulus of elasticity or Young’s Modulus. A high number indicates a stiff or strong material; a small number tells that the material is easy to bend. When one increases the force, the material reaches the area where it begins to yield. It changes its shape without an increase in force. This wriggle indicates the yield strength. After that, the material still resists deformation; however, the ratio is no longer constant. Applying forces, which take the material in this area are the forces needed for work or stress hardening. The highest stress a material can take is called ultimate strength. This is usually an unsteady area, a small increase in load can cause a significant change in shape. A test sample would reduce its cross-section; thus it is called necking and the material yields again until it breaks. When a material returns to its original shape after deformation, then this deformation had remained within the range of its elasticity. Most common, elastic deformation is applied to springs. In diagram 2, I show it as the green straight line, starting at the zero point a and ending at an arbitrary point b. The material can be loaded and released and would always return to the zero point. Many materials and most steels behave in the proportional way of elasticity. There is a possible fracture due to fatigue. Since this would not occur in a fountain pen situation, I will not write about it. There is plenty of information on the internet. I show you diagram 2 again, here and in the next paragraph so that you don’t have to scroll up and down. Another reason for repeating it: I am pretty proud of it, so I like to show it off a bit. When a material is stressed with a load to a point where the deformation is beyond the yield strength (the wriggly section), then, after the load is taken away, there remains a residual deformation, in ingeneering, it’s called plastic deformation. I showed this with a purple line. It starts at the zero point e (same as a). 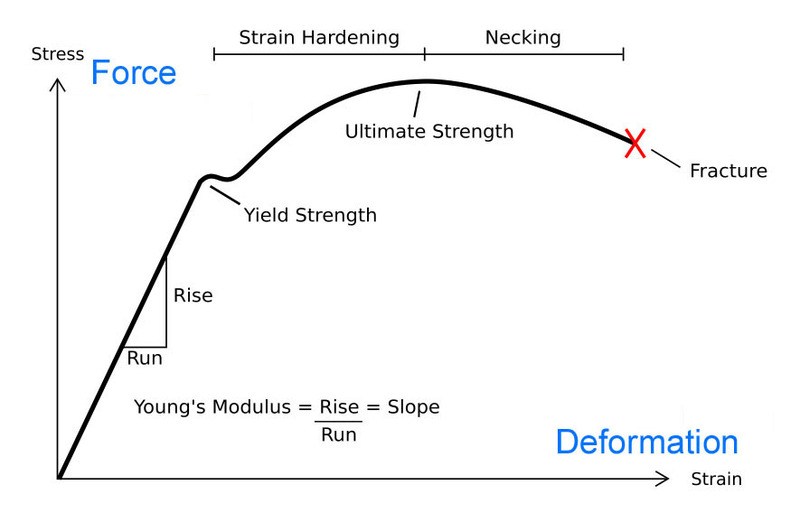 As the load increases, it passes point b, wiggles its way through the area of the yield strength YS, up to point f.
The stretching that happens between Yield Strength and point f is the process of work-hardening. 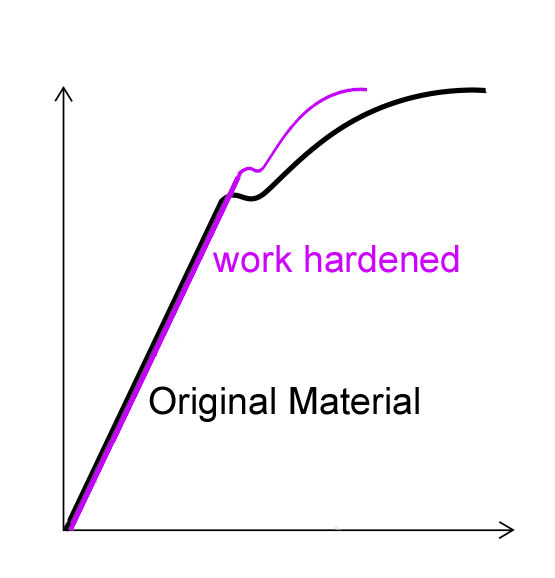 As the load decreases the curve follows the purple line from f to g. The properties of the material have been altered through work-hardening. The distance between the original zero point e and the new baseline point g is called residual or plastic deformation. It finds application during shaping of components, making coins or nibs and dents in your car. This situation is obtained, when two components are held together under load. Applications are electrical contacts, suspension of a car as well as the tines on a nib. One wants to make sure that at the end position, when there is no load on the components that they definitely reach this point and stay there, together. We don’t want the tines to remain apart. This means, in order to widen the line of writing, we need to apply pressure and overcome the force, which holds the tines together. 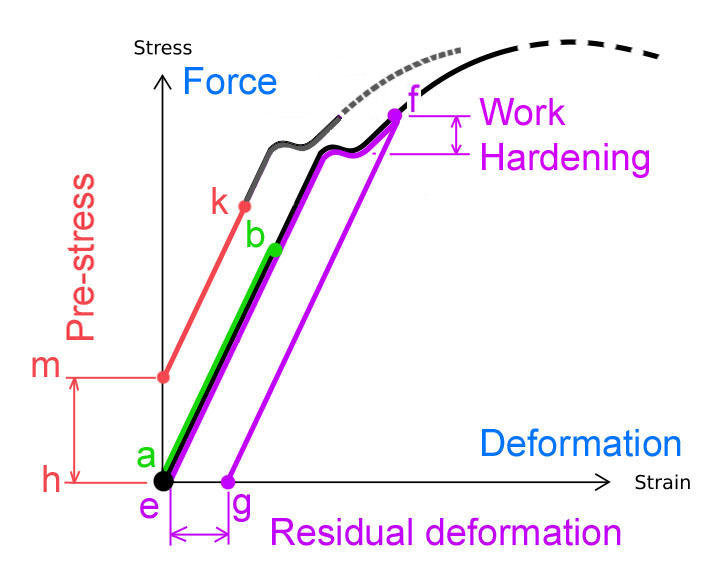 The pre-stress or load is indicated in the diagram as the distance between h and m. Before any deformation can occur, the acting force must go beyond this load. Then the deformation would follow the straight orange line to point k. In this case, it would be an elastic deformation, after the load is taken off, the stress-strain line would return to point m.
The pre-stress can be reduced by applying a load beyond the point k, beyond the yield strength. When the load is released, the curve will end at a point below point m.
In regards to nibs, the pre-load keeping the tines together can be altered using this technique. Increasing the load makes the nib feel harder, reducing the load makes it more responsive, thus feel softer. If all nibs would be handset at the end of production, then this force could be individually applied and kept to a minimum. Most nibs are mass produced, and tolerances must be compensated for. The stamping pressure for setting (see Nib Manufacturing in the section setting) must be high enough to still close the tines at the tip at unfavourable tolerance combinations. Therefore, the pre-load at the tines varies between nibs and thus, their responsiveness changing writing pressure. The range of variation depends on the precision of the manufacturing process. I give this topic more attention because it is significant in the manufacturing of nibs. It is a process where through plastic deformation, often with impacting force, like hammering, the material structure is altered and the material gets harder. A higher load will need to be applied to change this newly attained shape. This happens at several stages during the manufacturing of a nib. The flat profile is rolled from a flat strip. 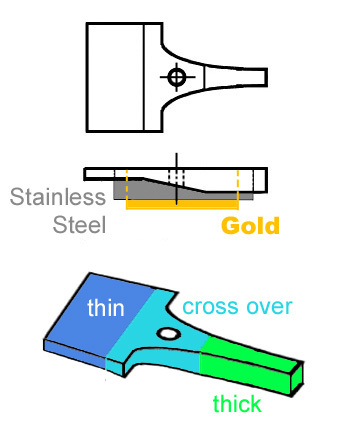 The stainless steel strip is thinner than the gold strip; it does not need much work-hardening. The primary issue is that the final profile is the same so that it fits the same tools for following processes. Why has it this contour? I talk about this in the Nib Function chapter. Once a component is work-hardened, one could say, it is made from a new, more brittle material. I show this in diagram 3. After applying and removing a load, the formed component will return to its new shape. Generally, the range of elasticity increases, but the range of deformation reduces, the material becomes more brittle. Allow me to remind you, one of gold’s incredible characteristics is: generally, it does not work-harden. Gold nibs are made from a particular 14-carat alloy with a higher content of nickel, see Nib Materials. As a thinking model one could say, work-hardening moves the material fibres closer together and therefore makes the material harder, keeps the stamped component in its new shape and holds the internal stress, the pre-load. If the stamping process has achieved the final shape of the component, all is good. However, in some situations, the hardening of the final component is not desired. In another case, the achieved shape may not be the final, and further stamping is required. The material is now too hard or brittle for additional modifications. During annealing, the component is heated to a point, where the material fibres can move apart again, and the internal stress is released. Unfortunately, with annealing, the shape of the component relaxes to some degree, as well. For each component, the annealing temperature needs to be found experimentally, a compromise between the degree of material softening and the relaxation of the shape. In my experience, both can make excellent nibs, even their material characteristics are worlds apart. Diagram 4 demonstrates this in proportion. How can this be achieved? Let me take away one problem, immediately. What you see, is their overall behaviour of those materials. The range of application for nibs, which is the minute spreading and closing of the tines, is only the small section of the bottom left corner, inside the red circle. How are the two materials be made useful for nibs? Most obviously, the answer lays in the difference of their design. Since in many cases the overall shape of the nib for stainless and gold must be compatible with the same feed, this is not the only solution. If the nibs of either material must be at least almost the same, one change in material characteristics is achieved through work-hardening, the other, through the application of different pre-stresses. We talked about these two techniques further up; you know now what this means. In the chapter How Nibs Work you will find more information on this topic. The next article is on Nib Mechanics where I talk about the movement of the nib and why the tip opens with increasing writing pressure.